Did you have a good Easter Sunday? It was another excuse to feast for us, so we ended up having a cooking weekend. My daughter Asi had a couple of friends over last Saturday. They were going to go on a picnic to celebrate her birthday which is next weekend, but it rained pretty hard on Friday night and we just knew the park was going to be too soggy to have a picnic. Instead, we stayed home and cooked, and at and cooked and ate some more. One of the things we cooked up were these steamed buns (siopao or sieu bao). I made steamed pork buns before (siopao adobo) and it’s always a hit with the girls. 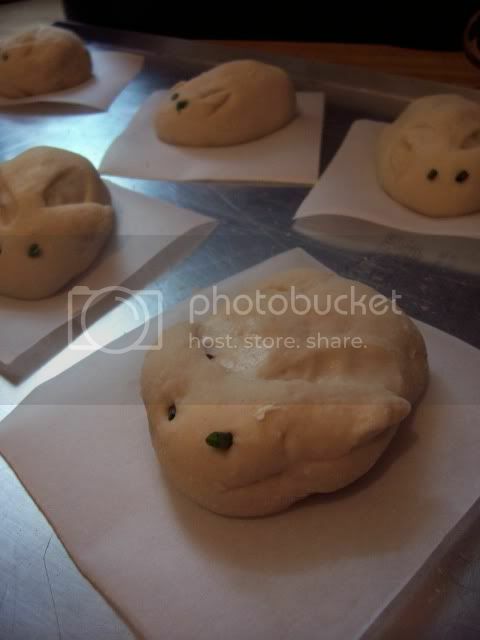 When I came across these bunny shaped baos from Just Hungry, I knew the girls would love making them for Easter. They were a little timid about cutting the ears so some of them disappeared after cooking, but they were still totally cute. For the filling, I decided to use up some left over pork roast that I had chopped up. Of course, the Clone had to come and make sure that I wasn’t making any ‘real’ bunny filling because she would have none to do with murdering rabbits. My disclaimer for The Clone: No real rabbits were harmed or used in cooking these cute little baos. Place all the dry ingredients in a bowl and mix well. Make a well in the middle and the oil and water. Start incorporating the flour mixture into the dry mixture until you have a cohesive mass. Turn this out onto a floured board and start kneading, adding more flour as you need to, until you have a smooth, elastic ball. 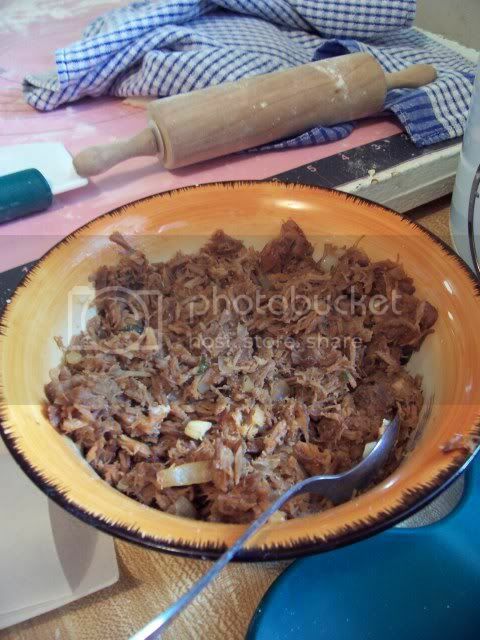 Place the ball in a bowl that has been oiled, turn the dough over once so it gets an oily coating on both sides. Cover the bowl with a clean cloth or plastic wrap and let the dough rise until it is doubled. After the dough has risen, turn it back out onto the floured board and divide into quarters. Roll the quarters out into a long roll about an inch thick and cut it into six equal pieces. Roll those pieces into balls then flatten them out into disks about 3 inches across. Place a couple of teaspoons (or so) filling in the center and wrap the edges of the dough over the filling (see recipe for the filling below). 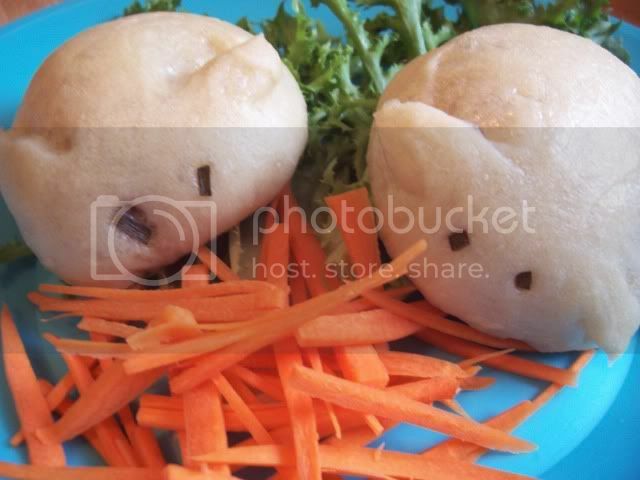 For photos on how to fill and shape your baos, go to Just Hungry. Place your formed bunnies on parchment paper and arrange them in a steamer tray, at least a couple of inches apart so they will have room to expand. Place the tray back over your steamer, cover and cook for 20 minutes. Place all the ingredients except cilantro in a skillet and mix together until heated through. Add the cilantro and set aside until cooled slightly. These sound delish, I’m going to make the dough in my bread maker the next time I have left over roast pork. I don’t have a steamer – how else can I steam the buns? Thanks, Garden Gnome 🙂 It was a great weekend and these were really fun to make. Oh those are cute! Thanks for the recipes. They are on my list of recipes to try. It sounds like you had a great Easter weekend. I used to advertise with you on EC but left there so was glad to see a link to your blog. I’m following your blog now so will visit again.